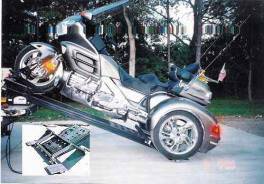 Motorcycle, Trike, Chopper, ATV, Snowmobile, Watercraft, Equipment etc. Just 2 Easy Steps ! 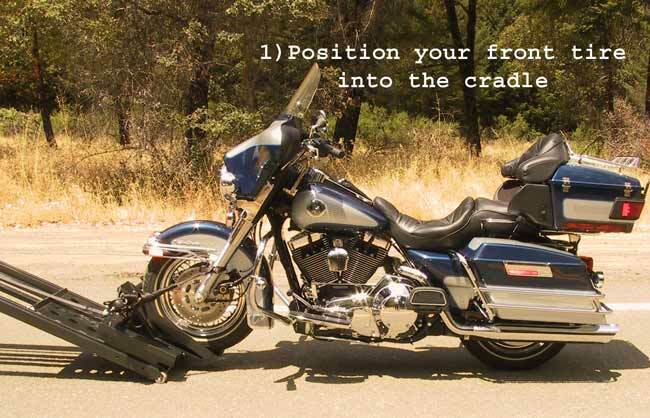 1 Roll a motorcycle up to the cradle and tie-down the front. 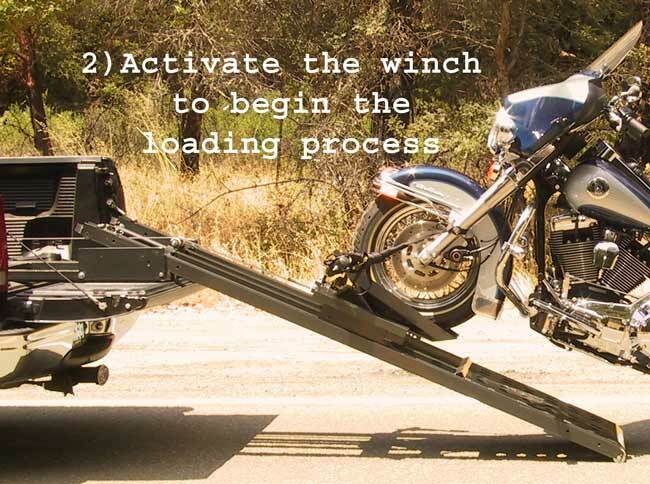 1 Press the Button and Pull back on the track to start the motion and let gravity and the controlled reverse action of the winch lower your bike to the ground. Removal - Removes easily. 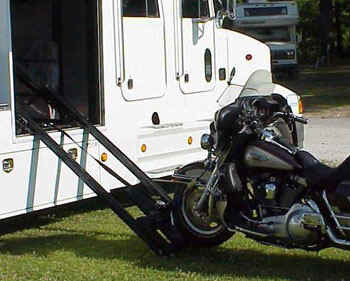 Simply, unbolt the three .5" attach bolts, unhook the quick disconnect power cable and slide the assembled lift from the bed of your truck. Convenient rear wheels allow roll-away capability. 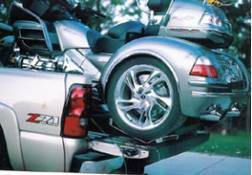 Additionally, unit can be removed by one person in 3 pieces of 55 Lbs, 110 Lbs and 135 Lbs. The two large pieces can be moved easily using the rollers on the end as dolly wheels. Construction - Units are precision welded utilizing tooled fixtures. It is made from 1/8 inch thick, high quality carbon steel. And, the black powder coated finish provides long lasting rust protection. Has drainage slots along lower track to keep tracks clear of moisture and debris. Uses maintenance-free HMW nylon rollers. No lubrication is required. 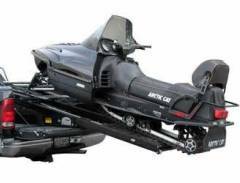 Complete with All Weather 12v 2,500 pound electric winch and cable remote control switch. 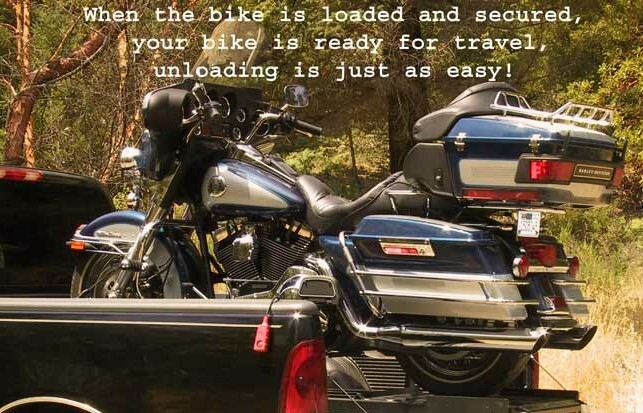 Flip the switch and watch your motorcycle load - safely, easily. Also included is an all weather cable - one end plugs into a socket on the unit, the other has 2 ring terminals that connect to the truck's battery. The Standard lift is 95" long, and 24" wide. Front tire cradle is 6" wide and sits 7" above truck bed. 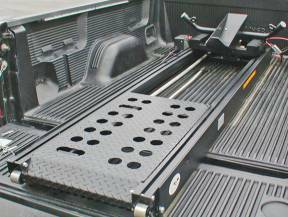 A bar is attached with two bolts through the floor and bed frame at the front of the truck bed. For all pickups, 3 holes are drilled through the floor and bed frame. Route the all weather cable from this bar, to the truck's battery. 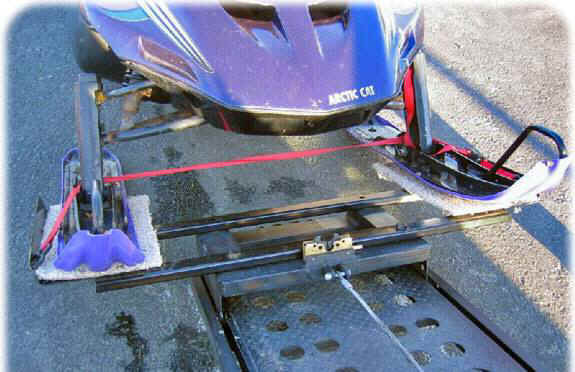 The pre-assembled lift together with the winch motor is then slid into the truck bed and attached to the bar with two additional .5" bolts. Plug into the quick disconnect and you're ready to go. 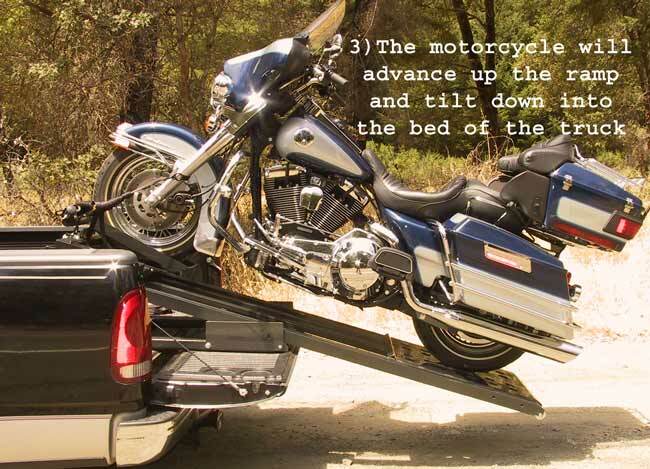 When in use, the tailgate must be removed on 8 foot beds and placed in the down position on shorter beds. Complete instructions are included with each lift.